What do fishing reels, oranges, and antlers have in common? How about teacups, maracas, and pears? Find out in no lumps, thank you: a bra anthologie - an uplifting and entertaining photographic collection of playful brassieres created from a wide and wild variety of common objects. From "Nest Enhancement," two bird nests adorned with delicate flowers and string, to "Hot Ta-tas," colorful Mexican bowls filled with peppers sporting braided green onion straps, artist Meg Spielman Peldo creates remarkably clever images that appeal to both sexes and virtually all age groups. 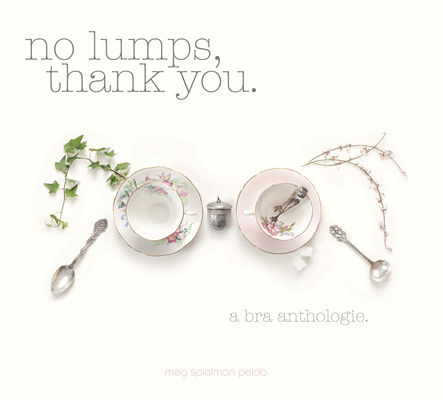 No matter what your relationship is with breasts and bras, this book will bring a smile to your spirit and a chuckle to your heart, with its quirky interpretations of the silly terms for them. A portion of the proceeds from this book will be donated to the fight against breast cancer. Meg Spielman Peldo is a fine art and portrait photographer and ceramic artist whose work in both media has been featured on HGTV's "That's Clever" artists series. She lives in Fargo, North Dakota.